"Candy Making as an Art"
Lee Sims Chocolates is owned and managed by the fourth generation of the same family. We are still located in the charming retail storefront where we started business many decades ago. 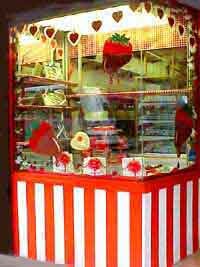 Our traditional "sweet shop" window displays are locally famous for their mouthwatering appeal. 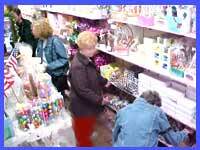 We have thousands of customers, individuals and corporations, all over the USA and beyond, who have chosen us as their dependable gift source and for personal indulgence in high quality chocolates at reasonable prices. When you phone us, you are connected to our store, not an impersonal "Call Center" for many different businesses. The writing up, assembly, packaging and shipping of your order are done on-premises under the daily supervision of the shop owner. This photo to your left shows just a few of our staff. Each holiday they agree among themselves on an appropriate costume accent. We assume you understand that we are not implying a connection with any magazine. Our kitchen, located in a nearby, custom-built facility, creates unique specialties. This web site shows only a small fraction of the items we offer from inventory and we enjoy creating items to order. For example, at a recent team fund-raising event, each guest received a miniature school-locker, complete with handle and louvers, filled with miniature chocolate soccer balls. Each ball's panels were made of alternating milk, white and dark chocolate to simulate the pattern of the real thing. Call us and we'll help you put together the perfect school-sales or charity campaign. For corporate publicity we'll create gift items to fit your budget and theme. We have small or large molds and inexpensive chocolate pops that look like computers, office supplies, autos, athletic equipment, corporate logos and just about anything you might imagine for a business promotion. But as a major holiday approaches we are open each Sunday 11A to 4P and stay open until at least 6PM week nights. After the holiday we revert to normal hours. Our area is rich in historical sites. We are a few minutes drive from the spot where Henry Hudson landed the Half Moon sailing ship in the early 1600s. We're a few hundred feet from the original boundaries of "Bergen," one of the oldest established European communities in this part of the world, founded about 350 years ago by Peter Stuyvesant of the Dutch East India Company. Bergen was absorbed into Jersey City more than 100 years ago. During the American Revolution, the street we are on was the scene of a fierce battle by ragged defenders under the command of General Washington and Marquis Lafayette against the British Army. Many patriots who fell during the Battle of Gettysburg, and later during the WWI Battle of Verdun, now rest in church grounds on a side street about four blocks away. We are two blocks from St. Peter's College, the oldest Jesuit university in the state. Our shop is easy to reach during lunchtime from Exchange Place, home to the computer operations of the world's largest stock trading and financial management organizations. Catch the "Montgomery/West Side" bus in front of 30 Montgomery St. About 10 minutes later, get off at the corner of Montgomery and Bergen Ave and walk a few yards around the corner. See the map). We are four blocks from a storefront Notary Public where a young graduate student notarized his laboratory notebooks that established him as the inventor of the laser. In a factory not far away, the graphite blocks that were used to assemble the world's first atomic reactor were manufactured. Nowadays, a large building around the corner from our store is often the studio for the films of Woody Allen and the video/sound stage for recording artists such as Elton John and many others. That building also is the local home of the New jersey National Guard. Nearby Liberty State Park was the primary triage and rescue center following September 11th.